Frederik July 19, 2017 Comment? 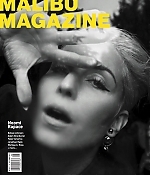 Noomi is featured in the current Malibu Magazine with a fantastic interview, by Felicity Martin, and a great new photoshoot. The last chapter remains the most interesting one: It’s not just the world of acting that Rapace is conquering. She’s just designed a clothing collection for a brand (“It’s very street, very hip-hop.”) She’s also launching a perfume later this year (“I’m doing a lot of stuff for fun,” she says). What I really want to know, however, is about the rumors she’s playing Amy Winehouse in an upcoming biopic. “Maybe … We’ll see. I’m involved in it, and I’m working on it, but all the components need to be right.” She smiles, explaining how, when they asked her to play Winehouse, she initially refused to read the script. “I have a strong connection to Amy. 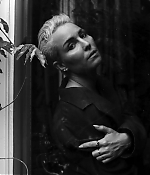 She was really present, her music, in the most critical moments of my life.” Rapace’s quest for perfection is particularly crucial on this project. “I can’t compromise on that one,” she urges. “The script needs to be amazing. It needs to be 100 percent. She is too important to me; my respect and love for her is just too important. It needs to be really brave and really honest and raw—and from my heart.” Rapace pours herself into all aspects of her career and life, from roles as villains or identical septuplets to perfume and key ring gifts for friends. There is no halfway. All considered, if Rapace eventually does tackle the role of Amy Winehouse, you can bet she’ll do it justice. The complete article can be read here.